Mrs May last week negotiated a delay in the deadline for Britain's departure from the European Union, which was due this Friday. EU leaders agreed to an extension to May 22 if Mrs May manages to get Commons approval to the withdrawal agreement reached between Britain and the EU. The agreement has already been roundly rejected twice. If lawmakers defeat the accord again - if it is held - London must outline a new plan or face a no-deal Brexit as early as April 12 -- unless it decides to request another extension and hold European Parliament elections in May. There were several reports on Sunday that a Cabinet coup was in the making, with several senior ministers insisting Mrs May must go. Some one million people on Saturday attended a massive march in London demanding a second referendum. The Commons is due to hold a series of 'indicative votes' to gauge which Brexit model has most support among lawmakers. 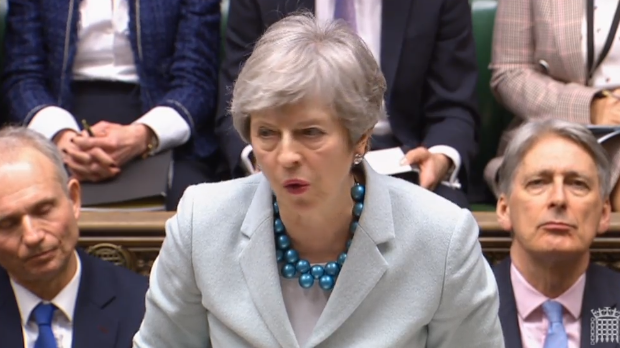 In her statement, May said she is “sceptical” about whether allowing MPs indicative votes will produce a decision. Opposition leader Jeremy Corbyn said the time had come for Parliament to work together on a Plan B. He said the government’s approach to Brexit had become “a national embarrassment” and last week’s EU summit was another negotiating failure for May. Replying to questions, Mrs May maintained her opposition to the holding of a second referendum or an early general election, insisting that her purpose is to honour the referendum and deliver Brexit.